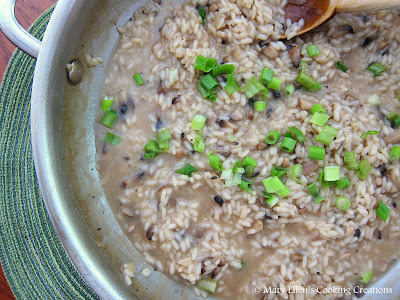 Gordon Ramsey would probably have my head if he heard me say my risotto was Asian inspired. But what's the fun of cooking if you can't get creative? For the past several weeks I have been on such an Asian kick, cooking things like Spicy Sesame Soy Noodles, Asian Pulled Pork, Yakitori, Vegetable Lo Mein, and finally got to cook with Sriracha Sauce in this Grilled Sriracha Chicken. Seriously, I have been cooking so much Asian food that Jon's only request the other night was "not Asian!" He has loved everything, but needs a little break. But before he said that, we decided to make the Grilled Sriracha Chicken for the second time in 2 weeks last week. I wanted something other than noodles for our side. I thought about fried rice, but prefer to cook rice the day before I fry it, and I was just an hour out from dinner. I ran with the rice idea though and decided to try adding Asian ingredients to risotto, leaving out the cheese. It was such a huge success - almost like creamy fried rice!! It had so much flavor - woody mushrooms, bright ginger, and the salty and nutty flavors from the soy sauce and sesame oil. I will absolutely be making this again! Pour broth into a pot; add soy sauce, sesame oil, and half of the ginger. Heat over low heat. Melt butter and oil in a large saute pan over medium-high heat. Add onion, garlic, the rest of the ginger, and mushrooms. Saute 3-4 minutes. Add rice to the pan and stir until everything is mixed and the rice is coated and the edges are starting to turn translucent. Lower heat to medium and add 1 ladle of broth. Stir until absorbed. Continue adding broth and letting it absorb until the rice is completely cooked, but not mushy - it should still have just a touch of bite. This process usually takes me 15-18 minutes from the time I put the first ladle-full of broth into the rice and I start tasting the rice about 12 minutes into this process. Top with green onions, adjust any other seasoning, serve immediately. What an awesome idea! Love the idea of this and hope to try a version soon.